I have been "running" my art-marathon in memory of murdered opposition leader Boris Nemtsov 358 days, I launched it the 3 March, the day of his funeral. Every day I am creating at least one Nemtsov's portrait. My goal is not only to keeping memory of the slain Putin critic, but also to attract attention to all victims of Putin's regime. As an artist, as a citizen and as a feminist I don't like dictatorships and authoritarian regimes. They try to suppress all human rights and civil liberties, they suppress freedom of speech and expression, freedom of the press, right to equal protection of the law... Not long time ago, all comparisons between Putin's regime and Stalinism were a kind of exaggeration and only a metaphor. But not anymore! For example the Russian civil rights activist Ildar Dadin was sentenced to three years imprisonment under new anti-protest law for repeated anti-government street protests - he stood alone with a placard in silence. There were two marathon's starts. The first start, I call it "presentiment" or "foreboding", happened Sunday February 22, 2015 when I finished an oil painting from the new cycle Thus spoke Zarathustra. "Man is the cruelest animal. At tragedies, bullfights, and crucifixions he has so far felt best on earth; and when he invented hell for himself, behold, that was his very heaven." The 2nd part of the diptych. Photo credit: Lena Hades. 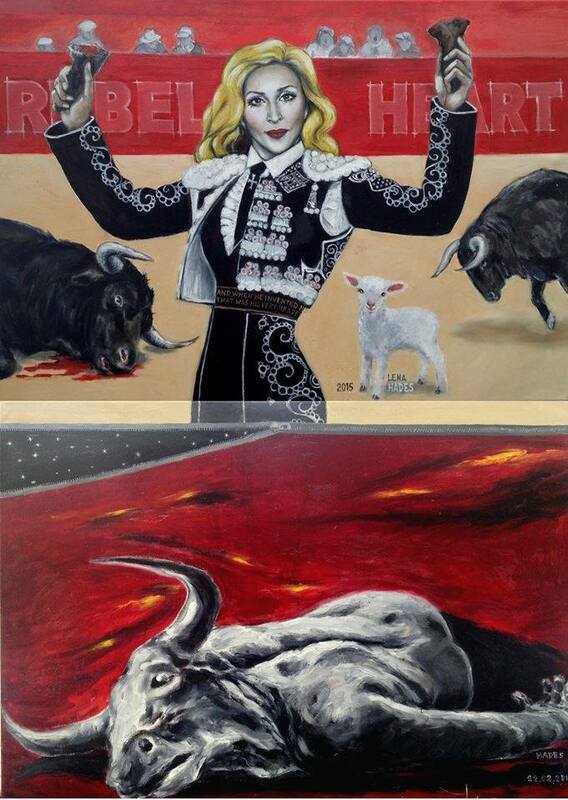 It was a diptych titled "Man is the cruelest animal. At tragedies, bullfights, and crucifixions he has so far felt best on earth; and when he invented hell for himself, behold, that was his very heaven." "Man is the cruelest animal..." Two parts of the diptych with Madonna on it. Photo credit: Lena Hades. 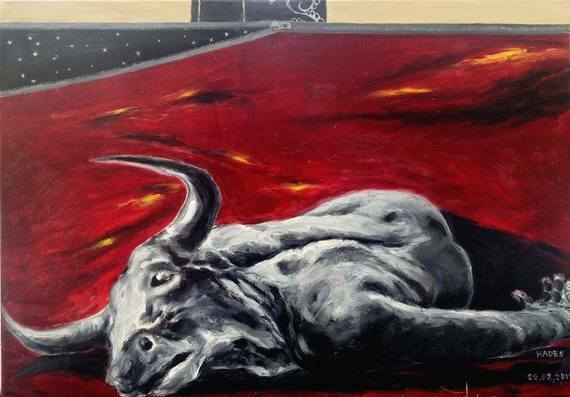 It represents a dead Minotaur lying in a pool of blood. I published it in my Facebook February 27, 2015 at 10 PM. An hour and half later I was informed that Boris Nemtsov was shot dead while crossing the Bolshoy Moskvoretsky Bridge. That day I posted the picture on Facebook and late night users of the social network, learning about the murder of Boris Nemtsov at the walls of the Kremlin, almost unanimously exclaimed that the picture looks prophetic and the Minotaur picture on in his power and strength was remarkably similar to Nemtsov shot dead. I was told that I predicted his death in this painting. The second strange coincidence that the emblem of the party PARNAS (Party of the people's freedom), created by Nemtsov, is a bull. The second start I launched the 3 March, the day of Boris Nemtsov's funeral. 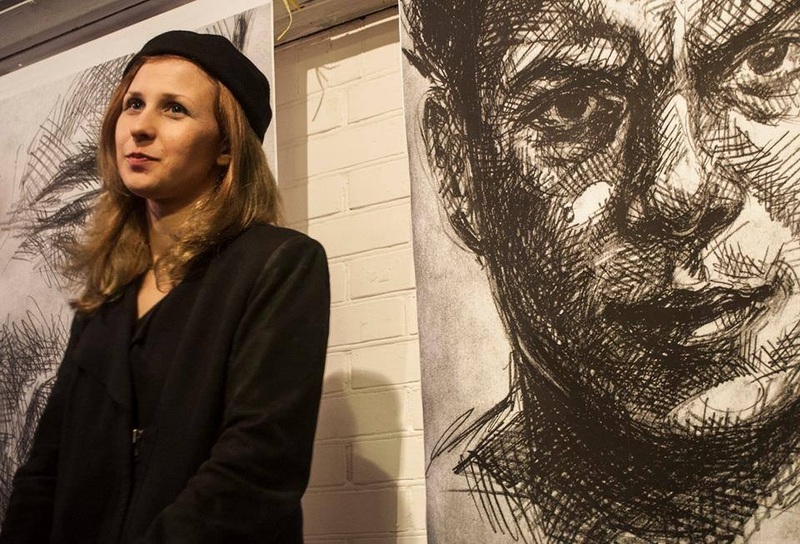 During my art maraton in memory of Boris Nemtsov I produced more than 350 Nemtsov's portraits. 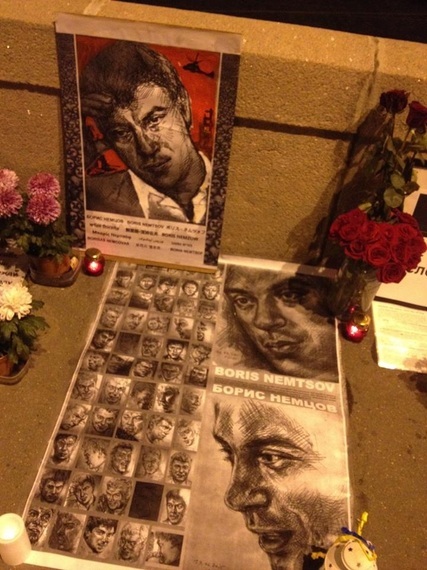 Some of them were exhibited three times - August 27, 2015 at the Sakharov Center in Moscow during the Memorial Evening dedicated to Boris Nemtsov, the second one at the Memorial concert for Boris Nemtsov in Basel October 9, 2015 where Russian musicians Andrei Gavrilov, Andrei Makarevich, and Svyatoslav Vakarchuk played their music and the third one at the exhibition "Nemtsov Bridge" in the Zverev Center of Contemporary Art October 9, 2015. Maria Alyokhina at the exhibition "Nemtsov Bridge" in the Zverev Center of Contemporary Art October 9, 2015. Photo credit: Lena Hades. The permanent Nemtsov's portrait exhibition has been holding since March 30, 2015 on the Bolshoy Moskvoretsky Bridge when some Russian civil rights activists printed my portraits by themselves independently from me and put them on the bridge parapet. Since April 14, 2015 I brought every day a new Nemtsov's portrait to the bridge. 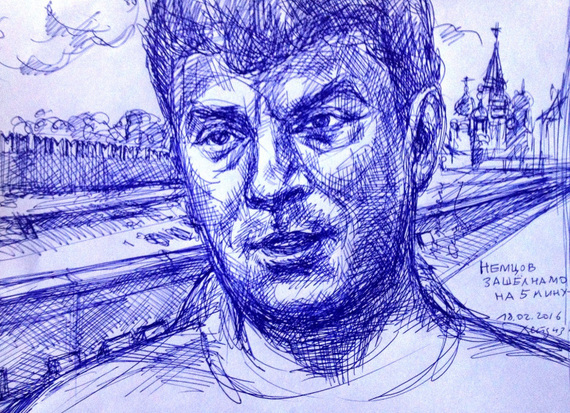 Nemtsov's portraits by Lena Hades. They were stolen. Photo credit: Lena Hades. And why did I bring portraits every day? Because the memorial was dismantled on orders from someone in the Moscow government every day! Every day, again and again some men of the Gormost (the city corporation that maintains the bridges) in orange uniforms dismantled and stuffed all my portraits, candles, photos and flowers into trash bags and hauled them off... During the whole year more than 300 Boris Nemtsov portraits produced by me, Lena Hades, were thrown away from the Bolshoy Moskvoretsky Bridge. I must say that I worked this year without holidays and vacations, every good graphic portrait took a lot of time. 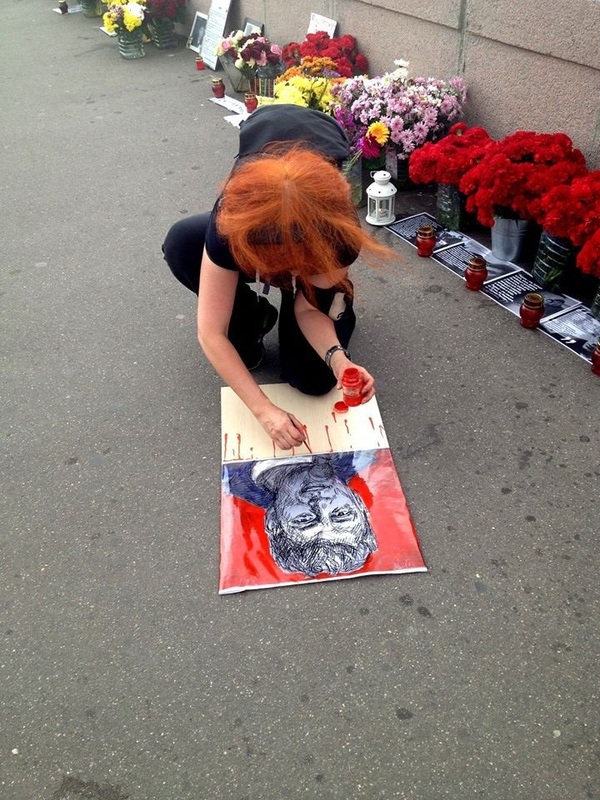 Lena Hades producing a new Nemtsov's portrait. Photo credit: Lena Hades. 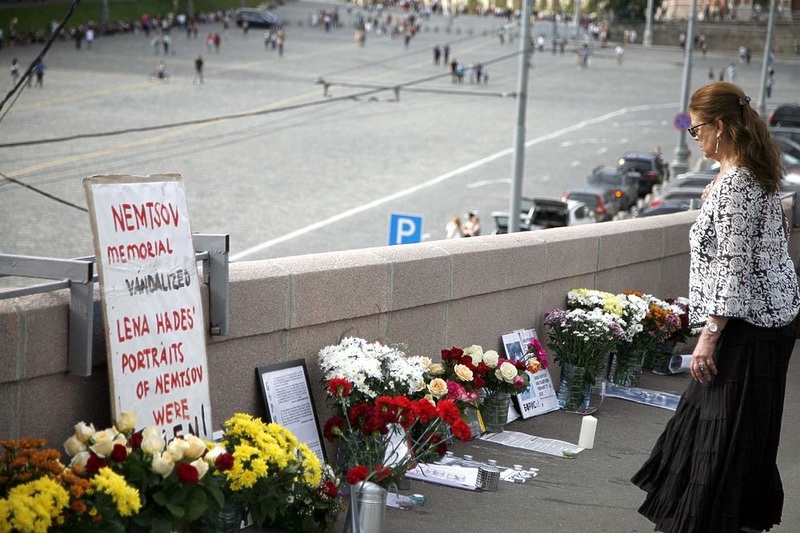 And all my Nemtsov's portraits on the Memorial were stolen and thrown away... The Memorial also has been attacked multiple times by Pro-Kremlin activists, during the attacks they beat the volunteers, destroyed my portraits, threw the candles and Russian flags into trash bags. For example July 23, during the next attack along with flowers, flags and photos 3 large graphic portrait of Nemtsov were stolen, I wrote a statement to the police about the theft of my works, estimating the damage in 9000$. Despite the fact that the attackers were immediately arrested, the police let them go. As always happens! Every day I create a new graphic portrait of Nemtsov, and new works from the series "Thus spoke Zarathustra", where Nemtsov speaks on behalf of the prophet Zarathustra. The number of portraits is growing every day - most of the portraits were located at the People's Memorial dedicated to Nemtsov, and some of the portraits became it's "face". My artistic goal was to make Nietzsche's philosophy more modern and actual - Russia nowadays needs a new type of citizen - more responsible, more open to the world, more intelligent and less imperialistic. In my today opinion Nietzsche's overman is not only a brave Putin's critic murdered near the Cremlin a year ago but also a Russian artist-woman who spent an entire year drawing him under permanent off-line and on-line attacks of Pro-Kremlin trolls, provocateurs, Pro-Kremlin activists and men of the Gormost... The art marathon in memory of Boris Nemtsov was a kind of overhuman action I suppose. Can you dedicate an entire year to drawing someone every day? I still can't believe I have spent my whole year drawing Boris Nemtsov, making one portrait per day for a whole year! I decided to to stop my art marathon the 3d March 2016. I would love to finish it with Nemtsov quote from his book "Confession of a rebel" - "I naively tried to change the world".